“posted by Julius Gavroche As a continuation of the collection of accounts of police violence-intervention from our last post, we share an essay by Peter Gelderloos on the function of the police within modern, capitalist society. No radical politics is possible except against the police, for they are an integral and fundamental instrument in the reproduction of capitalist social relations. This does not mean however they they should become the object of any open and exclusive counter-violence; but rather, that all should be done to create conditions in which the violence of the police is rendered pointless and they themselves cease to be necessary. In the mass protests-occupations of spain’s cities in 2011, for example, the police were often simply marginalised by the sheer scale of the mobilisations, or pushed back in many smaller, but determined, protests. The creation and defense of spaces of autonomy is only viable not against the police, but against the society as whole to which they belong. In other words, autonomy lies beyond policed societies. The police are a racist, authoritarian institution that exists to protect the powerful in an unequal system. Past and present efforts to reform them have demonstrated that reformism can’t solve the problem, though it does serve to squander popular protests and advance the careers of professional activists. Faced with this situation, in which Left and Right unwittingly collude to prolong the problem, the extralegal path of rioting, seizing space, and fighting back against the police makes perfect sense. In fact, this phenomenon, denounced as “violence” by the media, the police, and many activists in unison, was not only the most significant feature of the Ferguson rebellion and the solidarity protests organized in hundreds of other cities, it was also the vital element that made everything else possible, that distinguished the killing of Michael Brown from a hundred other police murders. What’s more, self-defense against state violence (whether excercized by police or by tolerated paramilitaries like the Klan) is not an exceptional occurrence in a long historical perspective, but a tried and true form of resistance, and one of the only that has brought results, in the Civil Rights movement and earlier. A pattern that becomes immediately evident is that police and prisons are only necessary in societies that are based on exploitation and inequality. The police are not an instrument fit to protect a society; on the contrary they are an instrument fit to protect an elite, parasitical class from society. Any society with a minimal practice of cooperation and solidarity can protect itself from individuals who would harm others. A hierarchical, militarized force such as the police, or an institution like the prison designed to remove conflict and transgression from the social sphere, only makes sense where there is a parasitical social class that exists in antagonism with the rest of society, and needs to manage social norms of right and wrong and monopolize violent force in order to preserve its power. Such a class also needs a justice mechanism, such as courts and a legislative body, to formalize its conception of right and wrong, and a propaganda mechanism, whether a state religion or mass media, to ensure that the exploited majority identify with their masters and reproduce the norms of the elite. When a normal person speaks out against throwing rocks at the police or destroying businesses, they are expressing values that originate at the top of the social pyramid. Of course it gets more complicated when you realize that interests are always subjective, and people often get more out of identifying with a larger community, no matter how fictitious, than they do out of having food to eat or a roof over their heads. In the end, everyone from the CEO to the news anchor to the taxi driver or homebum with conventional ideas all participate in reproducing the same system, and they probably all sincerely believe in the positions they espouse, but some clearly have more influence than others, and can be identified as originators of certain aspects of the present system. Therefore, we are not speaking for the masses when we assert that the police and the prisons exist to control them, but we should also not shy away from espousing a radical position just because it will be unpopular. We need to have faith that a great many people might eventually come to support radical positions regarding the police. Many people already support parts of these positions intuitively or implicitly, and the reason that more people don’t, at least not expressly, is that so few people currently dare to declare the police an intractable enemy of freedom or to openly advocate a world without police. At this juncture, the last thing that we need is for more people to espouse tepid, inane suggestions for reform that are completely untenable and unrealistic. But as long as proposals for meager reform are taken seriously, that’s what we’ll get. We can’t get rid of police brutality without getting rid of the police, and we can’t get rid of the police without getting rid of an entire system based on exploitation, oppression, and hierarchy. There is no easy, band-aid solution to this problem, and bandying them about only perpetuates the problem. Foregrounding difficult, far-reaching changes does not mean, however, fixating an abstract gaze on a pre-designed future and blinding ourselves to immediate problems. On the contrary, we need to focus on how we fight now for a better world, and part of that means avoiding forms of action that make real changes even more improbable. This in fact is how most social movements in history have gone down. Whatever improvements have been won were actually won by those who fought for radical positions, using uncompromising methods and aggressive tactics, though the victories were claimed by the reformers, who tend to be a combination of dissident members of the ruling structures, opportunists who wish to climb the social ladder, and sincere people who have been duped by a discourse of pragmatism. Their own methods are too sedate to shake things up and force a change, in fact their timidity demonstrates to authority that they are ultimately a loyal opposition undeserving of repression. They must ride the coattails of the radicals in order to be in position when the rulers realize that some change is necessary in order to avoid an actual revolution. The reason that these movements always stop after an incomplete reform, and that the most ineffective sectors of these movements tend to get the credit, is because the reformers have a tendency to throw the radicals under the bus, helping the State eliminate them in exchange for access to power in its newly reformed configuration. After all, who better to discern what reform will best fool the people on bottom than someone who has recently come up from the bottom? Those of us who are critical of the mass media may have a hard time explaining the sympathetic position that Time Magazine or Rolling Stone occasionally took with the rioters. Of course, a couple articles hardly make up for thousands of syndicated columns objectively refering to rioters as some kind of pathological parasite, radio hosts calling looters “idiots” and worse, TV spots spreading fear about savage hordes of demons and outside agitators, days long NPR marathons urging peaceful protest, and so on. Nonetheless, the phenomenon is curious as well as significant. In the case of Rolling Stone, we could suppose that this old establishment rag is afraid of all the ground it has lost in the risqué news niche to dynamic newcomers like Vice; however the explanation would be insufficient. The seemingly subversive behavior of a few outliers is hardly unprecedented. In the recent insurrection in Greece, a large part of the media expressed sympathy with the rioters, albeit in a very formulaic way. In the media lens, young students were justifiably protesting in the streets after the police murder of 15-year-old Alexis Grigoropoulos, anarchists were hijacking the event to burn police stations, and immigrants were taking advantage of the situation to loot stores. None of these characterizations are based on fact. Millions of young people and old, Greeks and immigrants, participated in the uprising, in a variety of ways. Many students looted, many immigrants walked along with protests. A frequently expressed sentiment was that participation in the insurrection blurred all of these pre-established identities, in which case the media operation clearly intended to reassert them. With all three subjects, the media caricature refers to a prefabricated figure that the entire population was already familiar with—the socially concerned student, the pyromaniac anarchist, the criminal immigrant—that only ever existed on the glowing screen, because it was the media themselves that created it. That’s the brilliance of the media: they rarely have to verify their claims, because they operate within a virtual universe that they themselves have created. 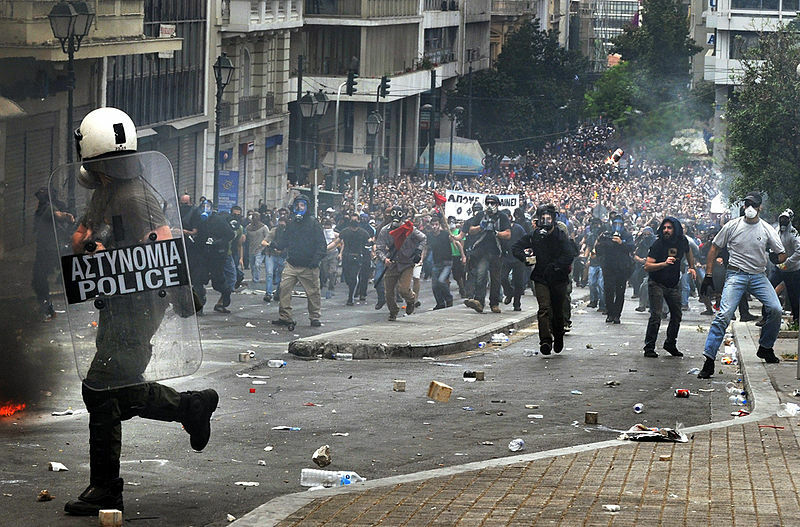 In the Greek example, it is obvious why the media would sympathize with student rioting: to discourage non-students from participating or identifying with the uprising; and to establish a limit of acceptable tactics, implicitly criminalizing the looting and the attacks on police stations. After all, the intensity of street fighting over three uninterrupted weeks was forcing the government to consider calling in the military. They were willing to tolerate burning barricades and illegal protests if things didn’t go further. Likewise, when people start to bring guns to protests as in Ferguson, there will be those among the forces of law and order who begin to see the wisdom in tolerating the smashing of banks. It’s noteworthy that the media only begin to stomach property destruction when talk of shooting back begins to resonate throughout society. And though within the confines of American dialogue, it feels like a breath of fresh air that Time Magazine would sympathize with rioters, it is a more or less calculated move that functions to limit the growth of resistance. Even if the editors of a magazine are not scheming consciously and explicitly about how to maintain social control, they are still individuals with a vested interest in the current system. People fighting fiercely for their freedom, unlike those who compulsively walk in circles or stage die-ins, often force a recognition of their humanity and win a limited sympathy from their enemies. They also make the existence of a social conflict undeniable. In such a case, people in power may come to accept tactics that they had previously condemned, to acknowledge errors they had previously denied, but their condemnation of forms of rebellion that are irreversibly destabilizing will only crystalize. People can be permitted to blow off steam, even in illegal ways, but they cannot be permitted to blunt or sabotage the instruments of the State. And when the police confront an armed population, they are suddenly much less effective. I believe the answer lies between the second and the third possibilities. Even though the abolition of prisons is not a likely future, from the present vantage, democratic capitalism increases its chances for survival by exploring contingency plans for extreme cases, and by giving opponents employment opportunities. The advantage is increased if “prisons” or “police” can be discursively transformed from an integral element of a whole system into a particular appendage that can be discarded or modified. And there are few methods of discourse more suited to carrying out this transformation than the academic—which favors specificity and an analysis of parts over wholes—and the activist—which tends towards single-issue messaging that favors the myopic over the radical. Even without a far-reaching reform that allows the pow erful to regenerate their methods for accumulating power, radical discourses in professional channels present other problems. One I have already hinted at can be thought of as misdirection. A professional approach to tackling the social problems underscored by Ferguson rarely returns people’s energies and attentions to the streets, where real change is created. True, most of the time, we don’t have something like Ferguson going on, so a patient, gradualist method seems to make sense. However, the conservatism of the professional approach often leads activists to play a pacifying role when a moment of intense struggle arises, as we abundantly witnessed this August and again in November. All across the country, even where they refrained from denouncing rioters, activist organizations called for vigils and speak-outs, when it was clear that the time for mere words had passed. Directly or indirectly, these mobilizations allowed a middle-class constituency to monopolize the social response and prevent rioting, at a time when an unprecedented number of people were ready to fight back. What’s more, the assumptions are all wrong. Ferguson is only exceptional in its extension, not in its spirit. Not a month goes by when someone does not shoot back at the police in America. Most of the time, however, they are a lone shooter, they often kill themselves or die in the act, and the media always publish unsavory details about their personal lives, true or invented. They also portray the cops as heroes, no matter what kind of people they actually were, and they never entertain the possibility that the shooters were justified, as they always do when it’s cops doing the murdering (actually, this is too charitable a description; many media outlets assert from the beginning that the killing was justified, not even allowing a debate). The recent shooting of the two cops in NYC fits the pattern perfectly, but earlier cases like that of Christopher Monfort in Seattle, Eric Frein in Pennsylvania, or Christopher Dorner in LA also apply. None of this should be surprising. There is a certain schizophrenia in a society that glorifies the police and suppresses or distorts any honest conversation about what people actually experience at the hands of police and what sort of countermeasures are adequate or justified. If large numbers of alienated people feel entirely alone in their brutalization and dehumanization by police, collective resistance becomes impossible. The only people to express an active negation of the police will be individuals who reach a certain limit and then snap. By the very nature of the problem they are not going to be the stable ones, especially if mental health is defined as an infinite capacity to accomodate misery. In Ferguson, rioters spraypainted the QT with the phrase, “free Kevin Johnson”, referring to a black man from an aggressively gentrifying St. Louis suburb who is on death row since 2008. Johnson shot to death an infamous bully of a cop who refused to help his kid brother as he lay dying from a heart condition. There is a direct connection between what are portrayed as isolated outbursts of senseless violence, and the massive rebellions that force society to at least stop and pay attention. I don’t, however, see the professionals making this connection. Typically they are either silent or help pathologize the lone wolves. The tragedy is, such incidents are only isolated as long as people in power AND people in social movements continue to actively isolate them. Recognizing the basic legitimacy of these acts isn’t to glorify the shooters as heroes. There is something sad in any death, no matter who the victim is, and we’re in dire straits when the only available means of resistance that people think they have are directly suicidal. The point is, there is a direct connection between the systematic brutality of police and the appearance of people who shoot back. Denying it only maintains the schizophrenic condition that forces us to pathologize a sensible human response to systematic abuse, preserves our psychological loyalty to a system that treats us like fodder, and prevents the development of collective measures. There have been attempts in the US to develop and spread methods of resistance to police that are collective, that brook no compromise, and that are less dangerous, less suicidal, than the method of the lone gunmen. The best known is probably the “black bloc.” And though it is clearly an imperfect tool, the bloc typically faces blanket denunciations by people who make no attempts to propose alternatives. In NGO-land, the trope that has been circulated is that the black bloc is the domain of young white men. Never mind that there are many testimonials by women, queer, and trans people attempting to counter this lie (and at great personal risk, since it requires speaking about personal involvement in an illegal activity); never mind that American anarchists have learned about the tactic not only in Europe but also in Latin America, where it is widely popular. The denunciations cannot be taken seriously as criticisms because they do not rely on realistic portrayals of the black bloc, they are formulated to silence rather than to engage, and they do not propose any alternatives for seizing space or collectively fighting back against police. We have the examples of societies that thrived without police, which I mentioned towards the beginning of the essay. Those stories belong to other cultures. I don’t think Westerners should use them as models or as ideological capital, but I think we should recognize their existence, to break the stranglehold that Western civilization has over definitions of human nature and human possibility, and we should also recognize that those other forms of being were violently interrupted by processes of colonization that are still ongoing. They are not marginal, idyllic stories of “primitive” societies with no bearing on modern reality, they are histories of peoples who are still struggling for survival. If, in the worlds we dream of, there is no room for them to reassert themselves independent of our designs, then whatever we create will only be a continuation of the thing we are fighting against. More appropriate as inspiration for our own action are a number of stories of struggle in Western or westernized countries in which people created police-free zones on the ground. After all, a holistic critique of the police means that by the very nature of the problem, we cannot ask government to institute the needed changes. Real steps towards a world without police can be found in the riots in Ferguson and other cities around the country where people surpassed their self-appointed leaders and actually fought back, rather than just manufacturing yet another spectacle of symbolic dissent. The riots in Ferguson were not only important in an instrumental way, forcing all of society to consider the problem; they also suggested the beginnings of a solution as neighbors came together in solidarity, building new relations amongst themselves, and forcefully ejecting police from the neighborhoods they patrol. Christiania is an autonomous neighborhood of Copenhagen that has been squatted since 1971. The area, with nearly a thousand inhabitants, organizes itself in assemblies, maintains its own economy and infrastructure, cleans up its trash, produces bicycles and other items in collective workshops, and runs a number of communal spaces. They also resolve their own conflicts, and with the exception of some aggressive incursions and raids, Christiania has been a police-free zone for most of its existence. Initially, the Danish government opted for a soft strategy, hoping that Christiania would eventually fall apart on its own. In the same era, the autonomous movement in the Netherlands and Germany was fighting major battles to defend their squatted spaces, sometimes defeating the police in the streets or burning down shopping malls in retribution for evictions. In context, the Danish approach made sense. However, Christiania thrived. Some suspect that the government was behind the crisis that threatened the autonomous neighborhood’s existence in 1984 when a motorcycle gang moved into the police-free zone to begin selling hard drugs (soft drugs have always been widely used in Christinia, while addictive drugs are vehemently discouraged). Earlier in Christiania’s history, there had been a fierce debate about how to deal with the problem of drugs. Over intense opposition, a part of the neighborhood decided to request police assistance, but they soon found that the cops were arresting the users of non-addictive drugs and ignoring or even protecting the proliferation of hard drugs. After that, Christiania decided to keep the police out, and their autonomy was well established by the time the motorcycle gang moved in. The gangsters thought they had picked an easy target: a neighborhood of hippies who not only disavowed making use of the police, they actively kept the police out. These drug-pushers, however, had fallen for capitalist mythology, which presents us all as isolated individuals, vulnerable to organized delinquents, and therefore in need of the greatest protection racket of them all, the State. Christiania residents banded together, exercising the same principle of solidarity that was at work in all the other aspects of their lives, fought back, and kicked the motorcycle gang out, using a combination of sabotage, public meetings, pressure, and direct confrontation. It is no coincidence that the same tools and capacities that allow us to fight back and free ourselves from policing are also the ones we need to protect ourselves from the forms of harm that capitalist democracies prosecute under the rubric of “crime”. Crime and police are two sides of the same coin. They perpetuate each other, and they each rely on a vulnerable, atomized society. A healthy society would have no need for police, no more than it would lock people in cages and hide its problems out of sight rather than deal with the conflicts and deficiencies that led to an act of harm being committed in the first place. The mutual relationship between police and crime was exquisitely revealed during the popular uprising in Oaxaca in 2006. 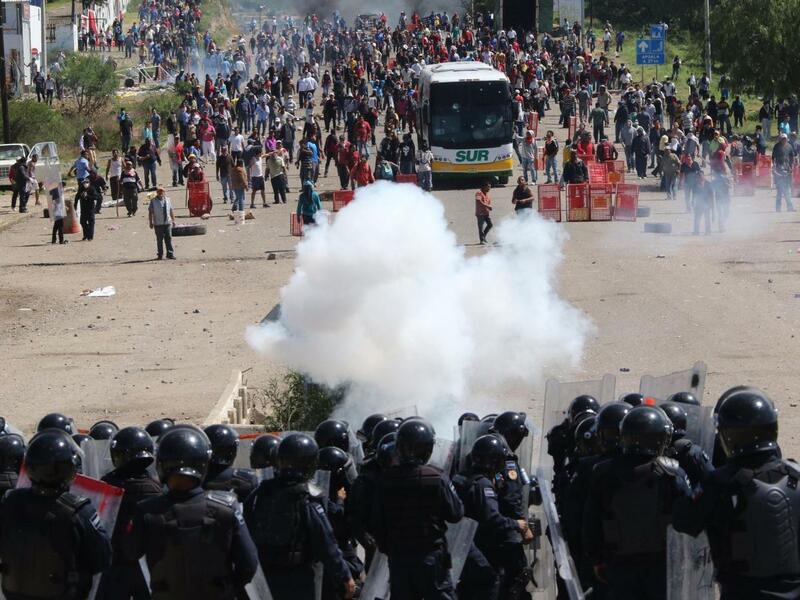 In June of that year, police viciously attacked the massive encampment staged annually by striking teachers. But the teachers fought back tooth and nail, quickly joined by many neighbors. They pushed police out of Oaxaca City, which remained autonomous for five months along with large parts of the countryside. People built barricades, which became an important space for socialization as well as self-defense, and they organized topiles, an indigenous tradition that provided volunteers to fight back against police and paramilitaries as well as to look out for fires, acts of robbery, or assault. The defenders of Oaxaca soon learned that the police were releasing people from their prisons on the condition that they go into the city to commit crimes. In protecting their neighborhoods against these acts, the topiles did not function like Western police forces. They patrolled unarmed, they were volunteers, and they did not have a prerogative to arrest people or impose their will, the way cops do. Upon coming across a robbery, arson, or assault, their function was not only that of first responders, but also to call on the neighbors so everyone could respond collectively. With such a structure, it would be impossible to enforce a legal code against an activity with popular participation. In other words, the topiles could stop a stranger who was robbing the store of a local, working class person (as were many of the neighborhood stores in Oaxaca), but they couldn’t have stopped the neighbors themselves from looting a store they already had an antagonistic, classist relationship with, as was the case in Ferguson. People in Oaxaca also had to defend themselves from police and paramilitaries, and they did so for five months. The topiles and many others were unarmed. They had to fight back with rocks, fireworks, and molotov cocktails, many of them getting shot in the process. Their bravery allowed hundreds of thousands of people to live in freedom for five months, in a police-free, government-free zone, experimenting with the self-organization of their lives on social, economic, and cultural levels. All the beautiful aspects of the Oaxaca commune are inseperable from their violent struggle against police, involving barricades, slingshots, molotov cocktails, and thousands of people who faced down armed opponents, over a dozen of them giving their lives in the process. In the end, the Mexican state had to send in the military as the only way to crush this flourishing pocket of autonomy. There is something beautiful about people finding the courage to fight back against a more powerful enemy, and people also flourish in surprising ways when they liberate space and take the power to organize their own lives. Neither of these things can be overemphasized. But neither should we romanticize. In the streets of Ferguson and other liberated spaces, much of the ugliness that infuses our society rears its head. But dealing with what had previously been invisible or normalized is an inevitable part of any healing process, and our society is nothing if not sick. Calamities like uprisings and riots can be important catalysts in processes of social healing, and liberated spaces, by forcefully casting aside the previous regime’s norms and relationships, that only functioned to reproduce and invisibilize all the ongoing forms of harm, can give us the opportunity to create new, healthier patterns, and engage in conversations that previously had been impossible. Empowering ourselves to fight back against those who have traumatized us, like the police, can be an important step in upsetting oppressive relations, healing from trauma, and restoring healthy social relations. This is, however, a dangerous proposition. Fighting back against the police, especially shooting back at them, as was happening in Ferguson, is not a safe activity. Change is never safe. And if we can successfully overcome the police to create a liberated zone, the State will eventually send in the military. Are the soldiers still loyal enough, after these last wars, to open fire on us? Has enough been done to encourage dissension in the ranks, or is the government firmly in control? There is only one way to find out. In the streets, we need to learn how to seize space, to make sure that those who fight back are never isolated, to make collective responses possible so no one has to react in an individual, suicidal way again, and to build a struggle that has room for young and old, for the peaceful and the bellicose, for those who know how to fight and those who know how to heal. It will be a long process, and in the meantime, there is a great need to speak loud and clear about a world without police, so everyone will know there is another way, beyond the false alternatives of obedience or ineffectual reform. Previous Previous post: Why is Facebook Banning Lesbians for Using the word ‘dyke’?